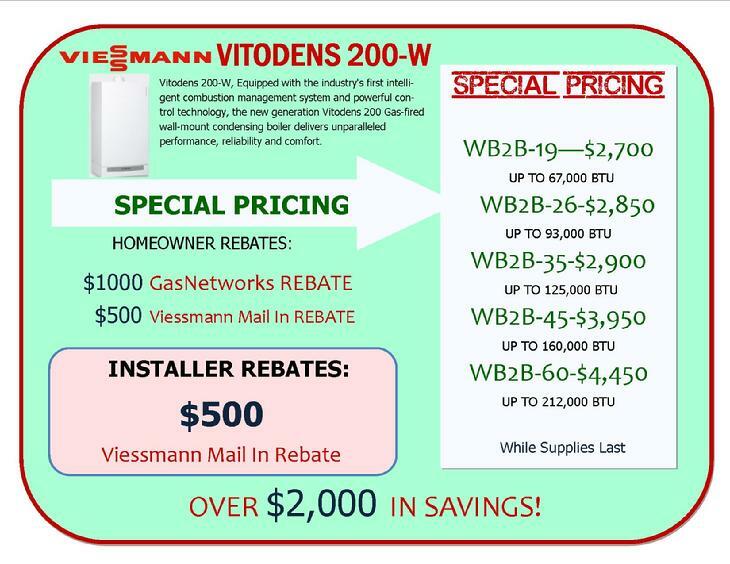 Viessmann WB2B 200 SPECIAL DEAL! Viessmann will compensate homeowners up to a maximum of $500** for the difference between the available utility rebate for boilers with AFUE >95% and the rebate amount the Vitodens 200 boiler now qualifies for with that utility. Homeowner would receive a $1,000 rebate from the utility and a $500 Supplemental Rebate from Viessmann. **This offer applies to Vitodens 200 and Vitodens 222-F residential boilers installed between February 1, 2013 and December 31, 2014. Step 1: Apply for the utility rebate following boiler installation. Call us toll free at 1.800.636.3222 for more information regarding the Supplemental Rebate Program and Viessmann products. * Design of Vitodens boilers has not been changed, and consumers should continue to experience the same high level of performance they did before the DOE certification test procedure was modified last year. Vitodens 200 boilers are highly efficient and continue to meet federal minimum AFUE ratings. ** Supplemental Rebate available for the purchase and installation of Viessmann Vitodens 200 models WB2B 19, 26, 35, 45, 60, 80 only. Supplemental Rebate amount varies and is dependent on difference between utility’s maximum applicable rebate for AFUE >95% and rebates for boilers with lower AFUE. A copy of installing contractor invoice, proof of amount received through energy supplier rebate, and details of utility’s rebate program must accompany Supplemental Rebate application form. This rebate is valid for installations between January 1, 2014 and December 31, 2014, and must be submitted by January 31, 2015. Cannot be combined with any other offer. For U.S. homeowners only.